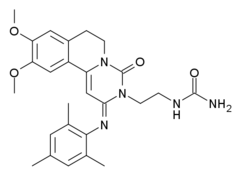 RPL-554 (LS-193,855) is a drug candidate for respiratory diseases. It is an analog of trequinsin, and like trequinsin, is a dual inhibitor of the phosphodiesterase enzymes PDE-3 and PDE-4. As of October 2015, inhaled RPL-554 delivered via a nebulizer was in development for COPD and had been studied in asthma. PDE3 inhibitors act as bronchodilators, while PDE4 inhibitors have an anti-inflammatory effect. In 2005, Rhinopharma Ltd, acquired the rights to the intellectual property from Vernalis. :19-20 Rhinopharma was a startup founded in Vancouver, Canada in 2004 by Michael Walker, Clive Page, and David Saint, to discover and develop drugs for chronic respiratory diseases,:16 and intended to develop RPL-554, delivered with an inhaler, first for allergic rhinitis, then asthma, then for COPD. :16-17 RPL554 was synthesized at Tocris, a contract research organization, under the supervision of Oxford, and was studied in collaboration with Page's lab at King’s College, London. In 2006 Rhinopharma recapitalized and was renamed Verona Pharma plc.